Driven by a strengthening global economic environment, last year’s total direct investment in real estate is estimated at $700 billion – a level not seen since 2006, before the financial crisis. Research we carried out indicates a further increase of 10%-15% in 2015 and $1 trillion in annual direct real estate investing by 2020. We expect investments to continue to grow because the market is on a sounder, more sustainable footing than it was before the recession and has more robust controls and scrutiny on investments. The improved controls include reduced reliance on leverage and greater use of equity, along with stricter underwriting standards and increased scrutiny by investment committees. Other reasons for optimism include new sources of capital from Asia and other emerging markets, and greater focus on direct real estate investment from institutional investors lured by low interest rates and an evolving regulatory environment. Our research identifies 30 cities that, together, received half of the total $5 trillion directly invested in commercial real estate over the past decade. What does the research on top investment cities say about current real estate markets? 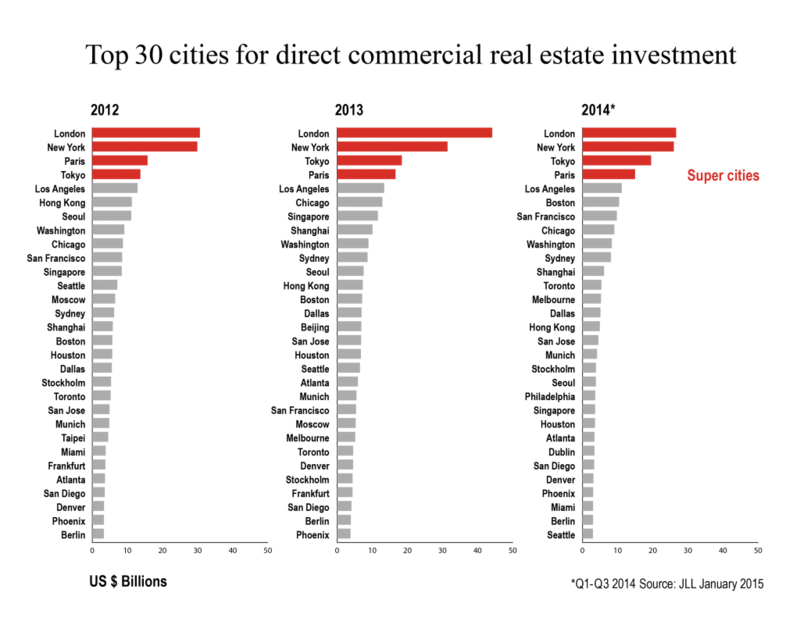 Megadeals helped four elite “supercities” retain their places at the top, where they have been for the past few years. Those deals involved large single assets, such as the Gherkin and HSBC office towers in London, the Pacific Century Place office tower in Tokyo, the Waldorf Astoria Hotel in New York and the Marriott Champs-Élysées Hotel in Paris. Two of the transactions were made by high-net-worth individuals, an emerging class of investors able to compete with institutions for trophy assets. An overall shift in investments to second-tier cities spiked in 2014. This was most apparent in Europe; for example, the number of transactions in London and Paris dropped 17% year on year, but increased 37% in the next 20 cities. In northern Europe, mid-size cities experienced particularly high levels of investment as a proportion of GDP. Municipalities like Dusseldorf, Hamburg and Munich, Amsterdam, and the Nordic capitals of Oslo and Copenhagen attracted corporate tenants and investors with transparent and stable real estate markets that boast strong technology and environmental credentials. Investment growth also extended to such cities as Dublin and Madrid, almost untouchable just a few years ago. Dublin, which jumped to 24th in the global investment hierarchy (from 93rd in 2013), also had the world’s fastest growth in office rents over the past year. In the United States, commercial real estate investment volumes in primary cities (New York, Los Angeles, Chicago, San Francisco, Washington and Boston) increased 66% year on year, compared with 37% for the overall US market. Some secondary markets, such as Philadelphia, Miami and Charlotte, experienced increased interest from domestic institutional buyers. Outside of trophy core-plus deals, foreign buyers were not as active in most secondary cities last year. Transaction volumes in secondary cities are expected to increase in 2015 as more assets come up for sale. Most pan-Asian investment in 2014 focused on the major markets of Tokyo, Sydney, Melbourne, Hong Kong, Singapore, Seoul, Shanghai and Beijing. With lower volumes and lower transparency across the region, there was less appetite for secondary-city opportunities outside of trophy or core properties. Interest in multifamily assets, a focus of investor activity in the US, spread to countries including the United Kingdom and Australia. 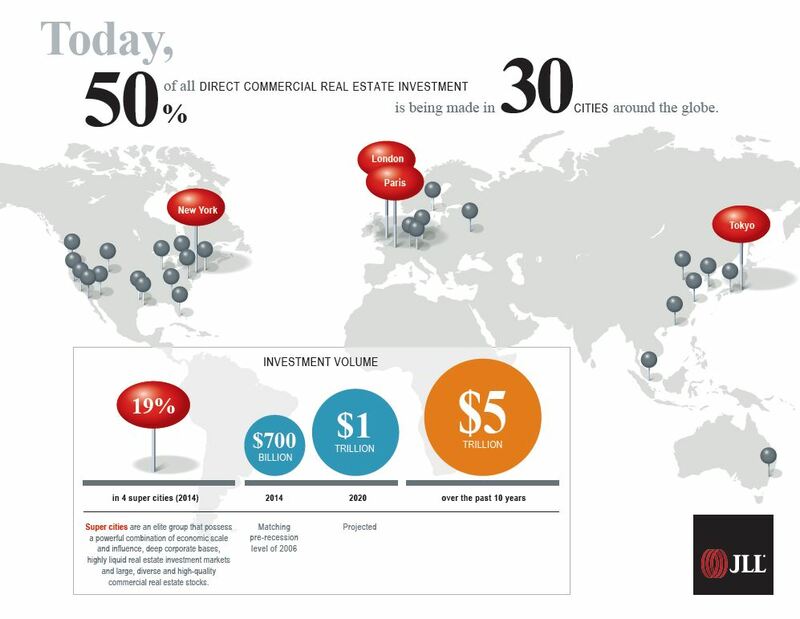 Additionally, Chinese residential developers have expanded aggressively into overseas markets in recent years, with a focus on London, New York, San Francisco, Toronto and Sydney. Image: Sunlight is reflected from Norman Foster’s “Gherkin” as it stands among other buildings in the City of London, seen from the viewing platform of the Monument, in the City of London February 16, 2009. REUTERS/Andrew Winning.